Several posts back I tested two packages for neural network time-series forecasting on the AirPassengers dataset. I want to now test nnetar against a full neural network framework (Keras) and see how it fares. 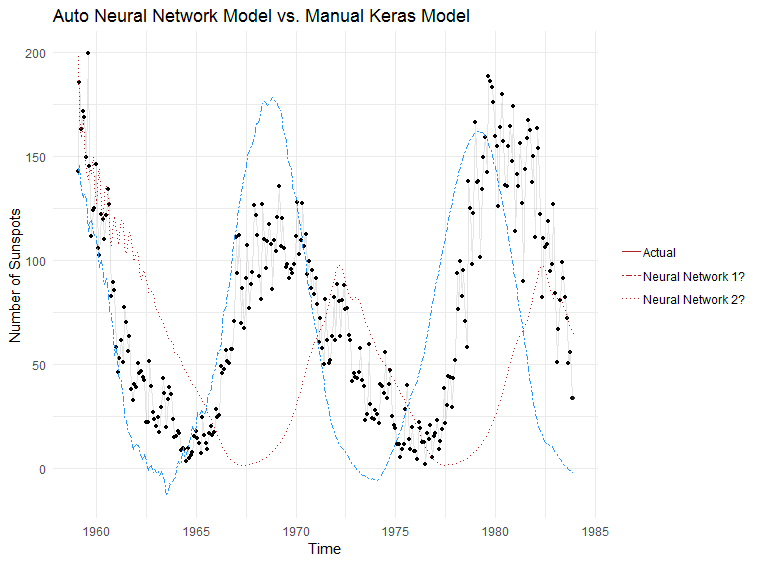 Setting up Keras to do a similar forecast is much more involved. Step 1 - we will need to manually prepare the dataset into a format that Keras can understand. The code is a bunch of scaling, centering and turning the data from a tibble/data.frame to a matrix. I will skip showing that section as I suspect you’ll find it boring and it takes up quite a bit of room. And the moment we have been waiting for… which model does a better job at making predictions?